The Skinny: Pretty stars and a great historical backdrop provide a welcome context for another overwrought romance in the Moment of Romance series. 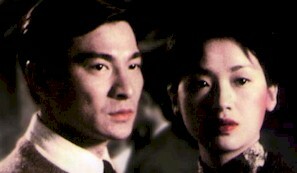 Third of the epic romantic drama series jettisons director Benny Chan in favor of the series' producer, Johnnie To. A Moment of Romance 3 finds usual leading lady Wu Chien-Lien as a peasant farmer during the 1930s and the Sino-Japanese conflict. She falls for a Chinese pilot (Andy Lau in brooding mode) who crashes in her backyard. She nurses him back to health, and they begin to fall in love, but she’s been promised to another and besides, he’s a city boy and she’s a country girl. Will love conquer all? Gee, I wonder.